Two days ago I bought a the "Special Warhammer 40,000 25th Anniversay Issue" of White Dwarf (386/Feb2012) - perhaps mainly because I've developed a soft spot for the cover of the original Rogue Trader* which was the reverse side cover (back, but reversible - blew my mind, that did) of Games Workshop's in-house catalogue magazine. Although the photos of models old and new are very pretty, and I'm drawn to offers of commemorative poster prints, I think I would have rather have spent the £4.50 on a TrollZine!4 which is free! Judging by the discussions on Vinn Ahrr Vin's Trollbridge Forum this collaborative work has been a long time in coming and has been eagerly awaited. Now born, after much labour, it is a mighty publication - at 61 content-dense pages, perhaps proving that simpler role-playing systems can inspire many creative ideas for use within many different styles of campaign. 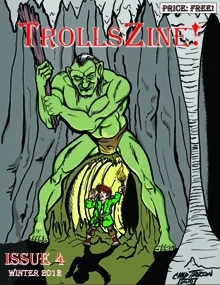 Naturally, you will get the most out of this publication if you are familiar with Tunnels & Trolls (like other products it caters for the popular editions arc of 5, 5.5 and 7 - incidentally I'm pleased to see a set of quick reference tables for use with 7 -useful for old duffers like me who grew up with 5). If you're new to T&T, or perhaps put off in the past, the more silly humour associated with D&D's only-so-slightly and irreverent younger cousin, I recommend downloading this along with the Flying Buffalo's free rules ( http://bit.ly/TTRulesFree ) - shaved down edition 5+, very useful for playing many of the solo texts kicking around on the internet - also you'll get a feel for how it all works (although I might add that the solo in TZ4 is for the 7.5 rules - but I haven't looked carefully enough to analyse major differences with 5th). I'm proud to say that a couple of my own doodles made it into this publication (I'm listed under my real world name of "Meddis") It's a shame that some of my colour efforts didn't make it and now I can see that my more scratchy attempts were clearly more adaptable to the content (interesting lessons being learnt here). I've been holding off running some stock art packs through Inked Adventures (on blogger), partly because I feel might further disappoint players who use my dungeon floor plans (the product line for which is embarrassingly slow with new releases), but maybe now I'd be forgiven for selling some of my better pieces. Back to the TZ: there's some real community celebrities contributing to this work - infamous and famous writers and artists -literally too numerous to mention- check out the "Troll Links" at the back of the PDF for the huge resource of blogs, sites and stores run by these guys.